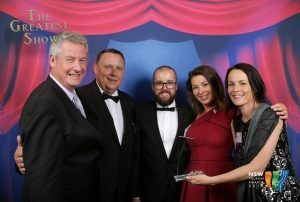 After a huge year of comprehensive park upgrades and tourist offerings, the Reflections Holiday Parks group and team at Seal Rocks are celebrating the park’s triumphant result at last night’s prestigious 2018 NSW Tourism Awards held at Luna Park.Considered an industry event of the year, the awards recognise the outstanding achievements of tourism businesses across the state. A first-time finalist at these awards, the Reflections Holiday Park at Seal Rocks earned a silver for its strong commitment to delivering high-quality accommodation and experiences to visitors. Reflections Holiday Parks CEO Steve Edmonds said this year saw significant landmarks reached, with the park having recently completed $6 million in accommodation and recreational upgrades, as well substantial upgrades in WiFi infrastructure to dramatically improve the digital experience and phone reception for guests. L-R_Reflections Holiday Parks CEO Steve Edmonds, Regional Manager Mark Martin, Seal Rocks Managers Eddy and Justine Syme & Executive Manager Marketing Rebecca Smith. Reflections Holiday Parks Seal Rocks was also recognised as a Quality Tourism Accredited Business at the awards under a newly-established Quality Tourism Framework. Governed by the Australian Tourism Industry Council, the new ‘Quality Tourism’ brandmark is a symbol of excellence for businesses participating in its quality tourism programs. Managed by the Tourism Industry division of the NSW Business Chamber, the state’s peak business organisation, and proudly supported by the NSW Government, the NSW Tourism Awards celebrate and acknowledge tourism excellence in NSW. Visit www.reflectionsholidayparks.com.au to find out why these parks are number one and why Seal Rocks is a must-visit destination in the NSW North Coast.